The Pure Bliss Stroller Organizer is designed specifically to keep drinks firmly in place without spilling during any excursion with the little ones. It has two reinforced cup holders that are double insulated to keep drinks hot or cold. I am very impressed with the heavy-duty insulation used in these cup holders. It's unlike any other "insulated" bottle holders I have used. It definitely keeps our drinks cold, and holds tightly onto everything from bottles to sippy cups to drinks from the local coffee shop and keeps them upright. It even holds them in place when pushing the stroller over bumps. There is also a large compartment between the cup holders, which has a magnet top that you can easily flip up to grab things. I like how deep this compartment is, so there's plenty of room, although you can't fit a whole diaper bag's worth of stuff in there. Maybe one diaper and a small toy, pacifier or snack. The organizer also features pockets on the front that can hold cell phone, keys, and sunglasses. The middle pocket is lined with microfiber so it will keep a phone or glasses scratch-free. 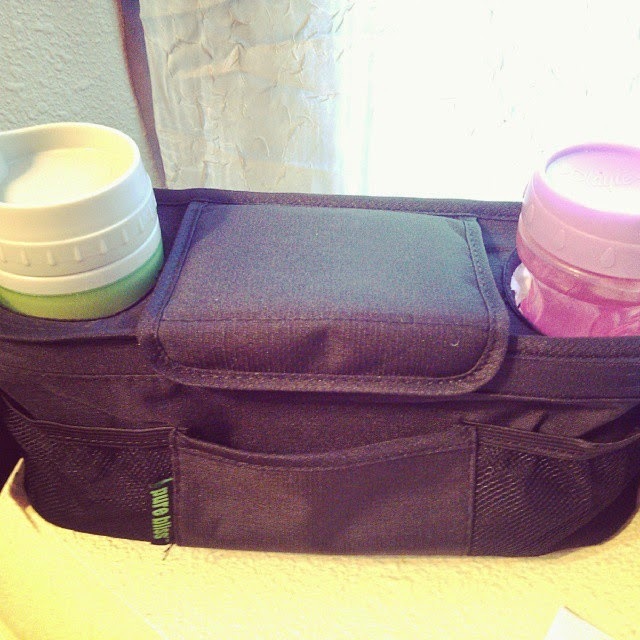 The material of this organizer is thick and sturdy, and it fastens well onto stroller handles with heavy-duty velcro. It fits most stroller handles (even pet strollers) 13-21 inches wide, and folds down flat when not in use. Overall, I'd say if you're looking for an organizer to stash your essentials and keep your drinks cold or hot, this is a great option.